On May 4, 1972, a group of seven women led by Bille Mae Brautigam Hardee, decided there was a need in the Northwestern Harris County and Southwestern Montgomery County area for a genealogical society. They were brought together by a common interest in family history and they all lived in and around the Tomball/Magnolia area. This became home base for the group. The name given to their new organization was the Labor of Love Genealogical Society. Within a few months, the Society was up and running. The first formal Society meeting was held on September 18, 1972 at the Tomball Branch of the Harris County Library. The forty-seven individuals who joined prior to December 1, 1972 were given charter member status. In September of 1974, the Society was renamed Chaparral Genealogical Society. During this time the Society began publishing its quarterly, "The Roadrunner." The Roadrunner contained genealogical records and was published from 1974 to 1991; back copies are available for review at the library. Chaparral has published many books of records for the Tomball and Montgomery County area including: The Klein Funeral Home Records to 1900, and Census and Marriage records of Northwest Harris and Southwest Montgomery Counties. On September 5, 1975, our Articles of Incorporation were approved by then Secretary of State, Mark White. Chaparral became a 501(c)3 non-profit organization on April 26, 1976. During the first year of operation, the Society owned forty books. Originally, these books were kept in members' homes. When this became too difficult, the collection was relocated to a lone bookshelf in a backroom of the Tomball Public Library. The years 1975 and 1976 were ones of continual growth. With close to five hundred books, a new home was desperately needed. The City of Tomball allowed the usage of a small, unoccupied room located in Tomball City Hall. It quickly became obvious that while this was a wonderful solution, Chaparral desperately needed a permanent home. With that, the members rolled up their collective sleeves and went to work on finding a way to make this dream a reality. The ensuing years were busy with many types of fund raising. In May of 1982 the Society purchased a small piece of land at 310 North Live Oak Street in Tomball, Texas. We were now proud land owners but almost broke and still in need of a building to house the growing collection of research materials. Providence stepped in with Society members, Harry and Iva Brenneman. The Brenneman's had built a small cabin which they used on weekends. Though only 600 square feet, no plumbing, no air conditioning, nor heating, the building was ours. The building, which had been flooded many times, was moved to the land on Live Oak. The Brenneman's also donated one thousand dollars to bring the building up to snuff. During June and July of 1982, volunteers were hard at work turning the weekend cabin into a library. On Thursday, September 16, 1982, the Chaparral Genealogical Society formally opened it's Library to the public. We continued to grow and acquire more and more books and research material and by 2010 our little cabin could no longer accommodate our ever expanding data base. The search was on for a new facility. 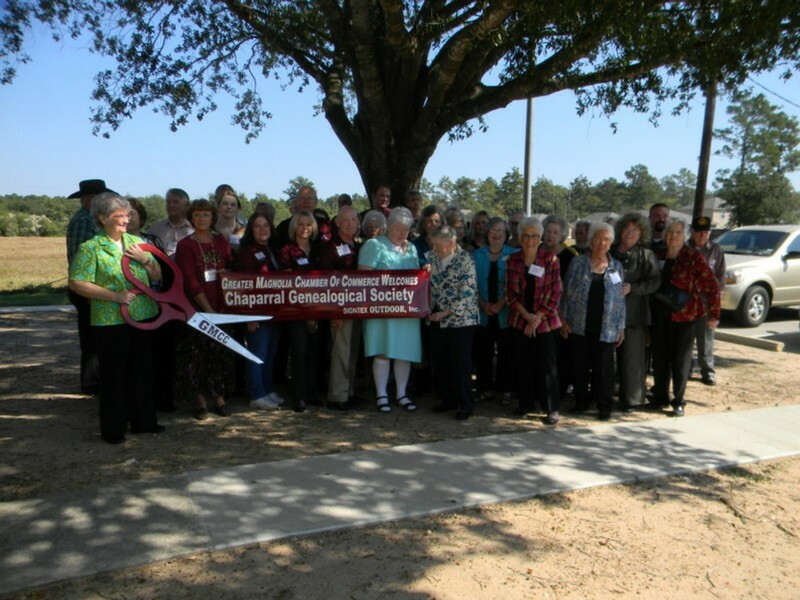 Montgomery County came to our rescue and on October 24, 2014 we opened our new Library in Magnolia, Texas. With 40+ years in Tomball, Harris County, Texas, we look forward to another 40+ years in Magnolia, Montgomery County, Texas. We continue to add to our library and are developing a research data base for Montgomery County History. We are a research facility open to the public. Our Society members are our volunteer Librarians and will be happy to assist you in your research. Library Hours: Tues.-Thurs. 10-2, Sat. 10-2, Closed 4th Saturday of the month for our meeting.